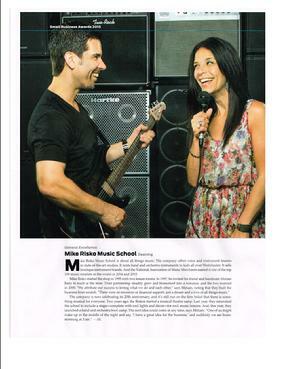 The following are excerpts and articles that have been published about the Mike Risko Music School. We invite you to visit us in the our school and to see our full gallery of articles on display. Go to contact for more information. Read the full article in Westchester Magazine Jan 2016 issue. We are featured as one of the places to try a new thing in 2016! Click on the link to see cool articles featuring Mike Risko Music! Riskos annual firemans parade parking lot party, read about it here! Riskos help Raise $2000 for sandy victims, read about it here! From the New York Times, read about the Riskos working together 24/7! From the New York Times 2004, about the Riskos sons first haircut at the well known Jerry's Barber Shop in Ossining. It's a common complaint from Parents, starting in the pre-adolescent years: Children would rather do just about anything than hang out with them. It's just not cool. But many youngsters and their parents in Westchester are sharing pastimes ranging from karate to rock n roll to painting. The connection helps keep the lines of communication open and, just as important, is fun too. ...but the involvement can run even deeper. When Adam Kornreich, 12, decided that he wanted to learn the guitar, his parents, Tom and Barbara enrolled him in lessons at the Mike Risko Music School in Ossining. His mother had played guitar when she was younger. Sitting in the waiting room during Adam's lessons rekindled her interest in playing. Adam's dad then decided to learn how to play the drums. Now the three of them are all taking lessons. They practice together in the corner of the laundry room of their Chappaqua home. Their play list includes rock standards as well as songs by current groups...they also play Adam's original tunes...."Sharing the music gives us the same vocabulary," Ms. Kornreich said. 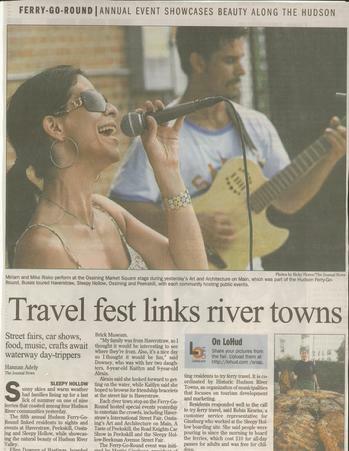 Picture and article from the Journal News September 2008. As the sun slides down the sky just after 4:30, the Mike Risko Music School on Croton Avenue comes alive with sound. Rebecca Chalsen, sits in the waiting room with her mother and sister. She has been studying music here for three years. "The teachers make it fun, " she says. "At the recital, I was the first to sing and play piano and I wasn't nervous." Miriam and Mike Risko like to hear that kind of confidence from their students. The Mike Risko Music School has grown steadily since it opened. Going from 40 students in its first year to more than 500 currently enrolled. Thirty instructors,operas singers, jazz players, song writers, folk artists are on staff. Performance is strongly encouraged. The Riskos assemble bands and produce showcases throughout the year. Although the school takes up the bulk of their time, the Riskos, who met while in a band still play venues....Over the years they have done jingle work and performed in bars and clubs and at weddings. In 2000 before family and friends, the couple got married inside the school. "This is very much a part of our lives," Miriam says beaming. "We like to make music fun. And it should be." Click on the picture to read about how you can ensure you have chosen the right place for music lessons. We are the featured expert in the issue of Westchester Family Magazine from December 2015. 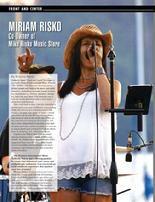 Mike Risko Music's Miriam Risko was featured in two national publications in 2019. The Music and Sound Retailer and the WIMN featured the article above. If you would like to read it, click on the link here. Mike and Miriam were the recipients of the 914 Inc Award for General Excellence in 2015. Click on the picture to read the article. Read about Mike Risko Music winning the 2017 Family Owned Business Award from The Westchester Business Journal. Read about Mike Risko Music's Sensory Friendly seating of Annie Kids for Special Needs kids here. Read about Global Make Music Day and how Mike Risko Music brought it to Westchester. Read about the Mike Risko Music end of summer concert with Rock Band Camp at the Ossining Waterfront 2016. Read about musicain Eric Gale's visit to Mike Risko Music. Read about Adam Miller performing at Mike Risko Music. Read about Best Selling Author Jen Sincero's visit to Mike Risko Music. 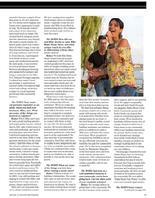 Read about Mike Risko Music 914 Inc Award for Business Excellence and celebrating 20 years in the community. Read Know Your Neighbor from The Examiner Newspaper featuring a story about Mike and Miriam Risko. Read about our visit from Lucie Arnaz in the Daily Voice by clicking the picture! Check out Mike and Miriam Risko on ABC TV in February 2011! You can also click on the link below to read an excerpt from Consumer Reports February 2011 issue in which Mike and Miriam were featured. Read about Risko Music School in the Fall of 2015 from the Examiner News Paper called "Know Your Neighbor"
Read the New York Times article here! Imagine working with your spouse: Daily battles at the office carried home at the end of the day, surely leading to the destruction of your relationship. Not necessarily. The mom and pop business model still works and it is enjoying something of a rebirth, especially in small entrepreneurial enterprises. ...Some married couples who work together find both their work and home lives enriched. "We are best friends and business partners," said Mike Risko, owner of the Mike Risko Music School in Ossining, which he founded in 1995 and now runs with his wife Miriam. Ms. Risko finds their relationship particularly advantageous in business meetings. I can look over at him and know what he is thinking," she says. "Sometimes its difficult not to talk about work when we leave, but we attribute a lot of our success to being able to brainstorm anytime," he says. "You can't imagine how many ideas we have come up with in the Food Emporium.